Kraft was only questioned for about an hour. Patriots owner Robert Kraft testified Tuesday in former Patriots player Aaron Hernandez’s murder trial. His appearance as a witness comes as the prosecution prepares to rest their case. 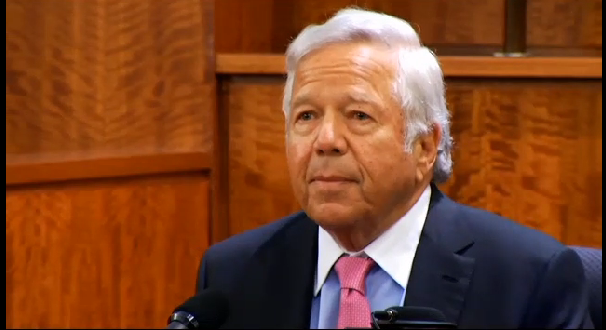 The prosecutor’s first question for Kraft was, “Do you work?” “I think so,” the owner replied. His testimony shed hardly any light on the experience of being an NFL team owner, but Kraft later testified that he didn’t follow details about Hernandez’s recruitment or the contract extension the Patriots gave him less than a year before his arrest. Kraft said that on June 19, 2013 — two days after Lloyd was murdered — he arrived at Gillette Stadium and was informed that Hernandez was in the building. Helicopters and media were already at the stadium. The Patriots owner said Hernandez hugged and kissed him on his way out of their brief meeting, which he says was something Hernandez did often. After Kraft finished his testimony, Patriots security specialist Mark Briggs was called to the stand. He said Hernandez know the policy that requires players to report any “potential criminal incident” to the team and the league. Prosecution is expected to rest its case later this week, and Patriots coach Bill Belichick is on the witness list and could be called to the stand.